David (daw-veed', Hebrew: דָּוִיד) was the second king of Israel from 1010-970 BC. With God's help, he defeated Goliath, the champion of the Philistines. Later he captured Jerusalem, which he made the capital city of Israel. David greatly extended the borders of Israel, which he ruled as a united kingdom. David was from the tribe of Judah, with his genealogy being given in Ruth 4:18-22. It is held that it is this tribe that Genesis 49:10 speaks of the Messiah coming from. (Genesis 49:10; cf. 2 Samuel 7:12-16; Matt.1:2, Heb. 7:14-17). David was the youngest of 8 sons of Jesse, who also had 2 daughters. (1Sam. 16:8-12; 17:2; 1Chr. 2:13-16) The name David, like the similar name Jedidish (2Sam. 12:25), comes from a root meaning “to love." David is the only person who bears that name in the Bible. David's ancestor Nahshon was chieftain of the whole tribe of Judah, (Num. 1:7; 2:3; 1Chr. 2:10) and brother-in-law of Aaron the high priest. (Exo. 6:23) The name of David's mother is not given, but it is recorded that David later placed his parents under the protection of the king of Moab, which some surmise may indicate that his mother was from that country, as the mother of his grandfather Obed was Ruth the Moabitess. (1Sam. 22:3; 22:1) It appears that David had a devoted father, thus giving David a good spiritual heritage. David was the second king of Israel, after Saul. David became king at the age of 30, and reigned over Israel for another 40 years before his death, and before his son, Solomon took his place. David cultivated sheep in his youth, which would require both tending to the needs of sheep as well as defending them, not only against marauders from the surrounding deserts, but also from the lions and bears which inhabited the country. This was work which, while then unknown to him, helped prepare him to later defend and lead Israel. David was called "the least of his father's household". 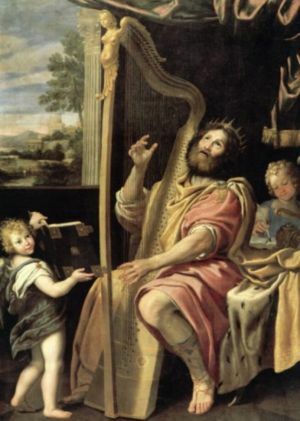 He was brought into King Saul's household to play the harp and to calm Saul's nerves, which had been increasingly troubled since he had sinned against God, and was told by Samuel that the kingship would be taken from him and given to another by God. David witnessed all of the warriors of Israel cower before a great Philistine giant, Goliath who would taunt them daily. David, a young shepherd boy, who had no military training, stood up and accepted Goliath's challenge. Saul offered him his armor, but David declined. David slew Goliath with a sling stone and cut off his head, which motivated the armies of Israel to rise up and scatter the Philistines. Saul became jealous of David and what he had accomplished, especially when he heard the people singing "Saul has slain his thousands, and David, his tens of thousands." David continued to play the harp for Saul, but it did not have the same affect. One day when David was playing Saul threw a spear at him to try to kill him; it missed. With the help of Saul's son Jonathan, who was David's best friend, David fled the palace and went into hiding. David fled Israel twice due to being hunted by Saul, gaining refuge with the Philistines. (1Sam. 21:10; Ps. 34:1; 1Sam. 27:1,2) Almost all commentators see these instances as acts of weakness and deception. During the latter stay in Philistine territory David attacked Canaanites which Israel was to have destroyed previously, while keeping the full reality of it from Achish. As a result of his alliance with the Philistines, David almost became part of the battle in which Saul and Jonathan were slain, but was Providentially delivered from this battle. (1Sam. 29) Being sent back by the Philistine's king Achish, David and his men discovered that the Amalekites had taken captive all their wives, and their sons, and their daughters. At this point, David was in danger of being stoned by his own people, but "David encouraged himself in the LORD his God." (1Sam. 29) Twice David could have killed Saul, and though he was urged to do so, his deep reverence for the Lord's anointed would not allow it. Instead, David cut off a piece of his robe (which he later felt was itself wrong) the first time, and the second time he took Saul's spear and the cruise of water, to demonstrate his innocence to Saul. (1Sam. 24; 26) After the first instance Saul was contrite, but soon he pursued David and his followers again. After the second instance Saul pursued David no more. Finally, Saul and his son Jonathan were killed in battle with the Philistines. (2Sam. 31) David grieved, executed the man that actually killed Saul, and became king of Judah. (2Sam. 1; 2) There was a long war between the house of Saul and the house of David: but David waxed stronger and stronger, and the house of Saul waxed weaker and weaker. (2Sam. 3:1) Finally Saul's son Ish-Bosheth was murdered in his own bed. The killers took the head to David seeking a reward, but instead David executed them for unjustly killing their own king. (2Sam. 4) Such killers are set in contrast to David, whose actions show his reverence towards those whom God appointed, and that he was not one who grasped at power or riches. David is revealed as a type of person who was "lovable." It is recorded that both Saul and Jonathan loved David, (1Sam. 16:21; 18:1,3; 20:17) as did all Saul's servants, (1Sam. 18:20,28) and all Israel and Judah, (1Sam. 18:16) and Saul's daughter, Michal. (1Sam. 18:20,28) David overall expressed great love for God, love toward others, and even toward personal adversaries, though he was also a mighty man of war. (Ps. 23; 73; 35; 69; 18) In addition, he was a man who served in many functions and situations, and manifested different gifts, and was called "the sweet psalmist of Israel" (2Sam. 23:1,2) who spoke by the Spirit of God. While David was appointed to be Saul's armorbearer (perhaps one of many), it is not recorded that he served as such in any battles, and the character and ability of David as a soldier is most fully provided in 1 Samuel 17. David's real ministry is manifested as that of his anointed playing of a harp type instrument, which drove the evil spirit away when he played so that Saul became well for a time. (1Sam. 16:14-23) However, as seen in the next chapter where David is back home, his service here appears to have been temporary, perhaps for now going backwards and forwards from Saul to feed his father's sheep in Bethlehem as needed. The committed friendship and Godly brotherly love between these two notable Biblical characters, amidst much danger and stress, makes their story one of the most remarkable ones in the Bible. The story of their friendship is mainly told in I Samuel, chapters 13-23,31 and 2 Samuel 1, two books which contain the history of the kingdom of God in Israel, from the termination of the age of the judges to the close of the reign of king David. Both Jonathan and David were daring warriors for Israel in its theocratic kingdom, in the land which formerly was that of Canaan, in which dangerous enemies were yet to be fought. In addition, the paranoia of King Saul over losing his kingdom to David, who was anointed by God through the prophet Samuel to be king, caused David, and finally his compatriot Jonathan (who recognized his future kingship), to be in danger of life. "David did [that which was] right in the eyes of the LORD, and turned not aside from any [thing] that he commanded him all the days of his life, save only in the matter of Uriah the Hittite." David died after ruling 40 years, 33 of them in Jerusalem, and set up his son Solomon as his successor. David was not allowed to build the temple because he was a man of 'blood' (a military commander), but his son could. David was part of the lineage of Jesus. Between 1966-1998, Avraham Biran lead excavations at a site known as Tel Dan, located in northern Israel. In 1993, an ancient Aramaic inscription dating to the 9th century BC was found containing thirteen lines of text that mention the 'House of David' (bytdwd). Preceding this discovery, the historicity of David was doubted by critics of the historicity of the Bible, however this discovery ended virtually all discussion on the historicity of King David, and is one of the greatest archaeological finds in recent times. One year later, André Lemaire published a paper where he found that the name of David also appears in the Mesha Inscription, which dates to about c. 840 BC. That same year, Émile Puech also independently came to the same conclusion. The inscription refers to David and his dynasty ('house of' David). The author of the inscription is supposedly Hazael. Shortly after this inscription was found, a large number of publications appeared on the inscription, and it was soon recognized that the inscription did in fact mention David and confirm his existence, which is now the consensus of scholars. Goliath lived in the Philistine city of Gath. In 2005, during excavations at Gath (modern day Tell es-Safi) headed by Aren Maier at Bar-Ilan University, a Semitic inscription was found dating from the 10th-9th centuries BC, bearing a name was found on a pot that highly resembles 'Goliath'. Whilst this was not the biblical Goliath, this discovery affirmed that people in Gath during the biblical timeline of David's battle with Goliath did in fact have the name Goliath and names like Goliath, which would not have been known to later authors. Aren Maier notes "What this means is that at the time there were people there named Goliath... It shows us that David and Goliath’s story reflects the cultural reality of the time." This astonishing discovery provided a historical and cultural background for the story of David's battle with Goliath, and established that the narrative was based in history—a fact that is very rare for ancient texts. In 2006, Israel Finkelstein and Neil Silberman published a book titled David and Solomon: in search of the Bible's sacred kings and the roots of the Western tradition, arguing that David did not rule over the great kingdom ascribed to him in the Bible, but rather was a highland chieftain ruling over a small, agrarian society. A number of scholars followed their interpretations, however as recently as 2008, a considerable amount of archaeological finds have been brought forth to challenge their claims, and in fact establish the great kingdoms of David and Solomon. Most prominent of these, are excavations of the Judahite city of Khirbet Qeiyafa lead by Yosef Garfinkel between 2008-2016. Radiocarbon dates have established a dating for the city of Khirbet Qeiyafa between 1020-980 BC, during the rule of David. Khirbet Qeiyafa was a major fortified city, that had two gates. All sites up until that time only had one. Secondly, there was a major administration at Khirbet Qeiyafa that stretched over 10,000 square feet, and the site was built of over 200,000 tons of stone. This city revealed that that kingdom of Israel at the time was nothing less than a true kingdom, and cast serious doubt on Finkelstein and Silberman's claims. Yosef Garfinkel, director of excavations at Khirbet Qeiyafa, says "Some scholars view King David’s kingdom as a simple agrarian society, sparsely inhabited, with no fortified cities, no administration and no writing… These scholars find it very hard to accept the new discoveries at Qeiyafa, which have completely dismantled these hypotheses." Khirbet Qeiyafa has been identified with the biblical city of Shaaraim because of its two gates. 'Shaaraim' means 'two gates'. More recently, excavations in southern Israel at the Timna Valley lead by Erez Ben-Yosef, from 2013 and currently ongoing, have also seriously damaged these claims by the Finkelstein, Silberman and their followers. This site dates to the time of David, and primarily during the reign of Solomon. In the Timna Valley, several key findings have been made. One was the discovery of foreign fabrics, which revealed that Israel at the time had complex trading networks. Secondly, the Timna Valley is a copper-rich site, and it has been revealed its copper-production in antiquity reached its height dating to the time of Solomon, producing an industrial level of copper to fuel nothing less than a kingdom. This revealed that the kingdom of Israel during the reign of David and Solomon was definitely an overwhelming regional power at the time, with an empire resembling that as described in the biblical narrative. Erez Ben-Yosef, director of excavations at the Timna Valley decided that based on these results he had acquired, "The historical accuracy of the Old Testament accounts is debated, but archeology can no longer be used to contradict them". Ben-Yosef later continued, "Today, we are discovering more and more evidence of a concentrated, hierarchical society that interacted extensively with its neighbors, which matches up with texts from the Bible and other sources." David ruled over a kingdom, and a kingdom would require a king. ↑ Biran, Avraham, and Joseph Naveh. "An aramaic stele fragment from Tel Dan." Israel Exploration Journal (1993): 81-98. ↑ Biran, Avraham, and Joseph Naveh. "The Tel Dan inscription: a new fragment." Israel Exploration Journal (1995): 1-18. ↑ Lemaire, André. "House of David; Restored in Moabite inscription." The Biblical archaeology review 20.3 (1994): 30-37. ↑ Maier, Aren. "An Iron Age IIA Proto-Canaanite, Philistine Inscription and Other New Finds From Tell es-Safi-Gath." Un trabajo presentado en el Encuentro Anual de las American Schools of Oriental Research, Philadelphia, Pennsylvania 8 (2005). ↑ Finkelstein, Israel, and Neil Asher Silberman. David and Solomon: in search of the Bible's sacred kings and the roots of the Western tradition. Simon and Schuster, 2007. ↑ Garfinkel, Y., and Katharina Streit. "Radiometric Dating of the Iron Age City." Khirbet Qeiyafa 2 (2014): 2009-2013. pg. 368. ↑ Garfinkel, Yosef. "The birth and death of biblical minimalism." Biblical Archaeology Review 37.3 (2011): 46-53. ↑ Ben-Yosef, Erez, Dafna Langgut, and Lidar Sapir-Hen. "Beyond smelting: New insights on Iron Age (10th c. BCE) metalworkers community from excavations at a gatehouse and associated livestock pens in Timna, Israel." Journal of Archaeological Science: Reports 11 (2017): 411-426. This page has been accessed 56,865 times.